308 Win [7.62x51mm] 145 gr FMJ Wolf MC Ammo | 500 Round CaseBe the first one to write a reviewMC308WINFMJCS20 round per box of Wolf MC 308 Full Metal Jacket, 145 grain ammunition. Consistent loads with precision-made Full Metal Jacket bullets provides tight-grouping accuracy at higher velocities. This 145 grain full metal jacket ammo is ideal for target shooting or plinking. 308 Win [7.62x51mm] 145 gr FMJ Wolf WPA | 20 Round BoxBe the first one to write a review41028520 round per box of Wolf 308 Full Metal Jacket, 145 grain ammunition. Consistent loads with precision-made Full Metal Jacket bullets provides tight-grouping accuracy at higher velocities. This 145 grain full metal jacket ammo is ideal for target shooting or plinking. 9mm Makarov ammunition 9x18 mm 94-gr FMJ steel-cased ammo. Russian ammo for your Russian guns! 308 Win [7.62x51mm] 145 gr FMJ Wolf MC | 20 Round BoxBe the first one to write a reviewMC308WINFMJBX20 round per box of Wolf 308 Full Metal Jacket, 145 grain ammunition. Consistent loads with precision-made Full Metal Jacket bullets provides tight-grouping accuracy at higher velocities. This 145 grain full metal jacket ammo is ideal for target shooting or plinking. 308 Win [7.62x51mm] 145 gr FMJ Wolf WPA | 500 Round CaseBe the first one to write a review410287500 round per case of Wolf WPA 308 Full Metal Jacket, 145 grain ammunition. Consistent loads with precision-made Full Metal Jacket bullets provides tight-grouping accuracy at higher velocities. This 145 grain full metal jacket ammo is ideal for target shooting or plinking. 6.5 Grendel Ammo (6.5x39mm) Wolf WPA Ammo. 100gr FMJ. 6.5mm Grendel puts big caliber punch in an AR-15. A larger bullet and stouter charge, 6.5 Grendel far exceeds the capabilities of the 5.56/223 round. 6.5 Grendel makes for an great hunting or target cartridge. Wolf Performance Ammunition 7.62x39mm Coppet Jacketed NON-Corosive Berdan Primed 500 Rounds Made in Ukraine. 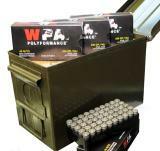 Wolf 7.62x39 ammo, perfect for your AK's and SKS's. Wolf 7.62x39 123gr Bi-Metal HP [Hollow Point], 20 rds per box. Bimetal Jacket, 123 Grains, 2396 FPS. Wolf WPA Military Classic 7.62x39 124gr Bi-Metal FMJ, Mil Spec, 20 rds per box. Bimetal Jacket, 124 Grains, 2330 FPS. Wolf WPA Military Classic 7.62x39 124gr Bi-Metal Hollow Point, 20 rds per box. Bimetal Jacket, 124 Grains, 2330 FPS. Wolf Gold 8mm Mauser (8x57mm) Ammo is made to SAAMI, in brass cases and a196 gr Soft Point-Boat Tail bullet (SP-BT) of lead with a copper jacket, which provides tight-grouping accuracy at higher velocities! 8mm Mauser (8x57mm) SP-BT, Boxer-primed, reloadable, non-corrosive. Muzzle Velocity: 2461 FPS out of a 20" barrel. 20 rd per box. This 196gr Soft Point-Boat Tail bullet (SP-BT) ammo is ideal for target shooting or hunting.